A terrorist attack on a familiar city can inspire a response among global observers not unlike that of motorists passing by a horrible car accident. We slow down to look, to try to understand what happened, see who was hurt, and wonder about the fate of the fallen. It isn’t blood and gore we’re after. It’s recognition. Are the victims like us? Could that have been me? The horrible events in Paris inspired a round of global rubbernecking and then a sloppy debate over whether the Western World cares more about the victims in Paris than those in Beirut or Kenya and now Mali. Predictably that debate quickly evolved into one over race and ethnicity. But there’s a deeper question to be asked here: How exactly does empathy work? 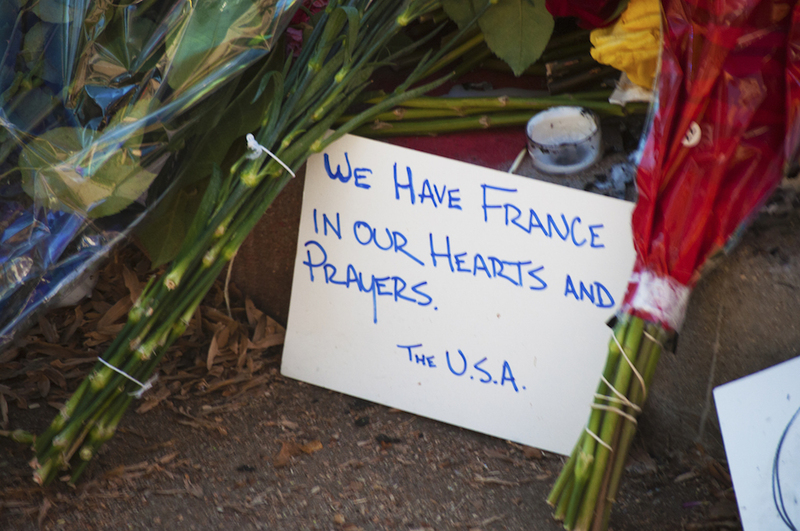 When the news of the Paris attacks hit, I was in a meeting in Washington, D.C. with a French-born publisher who quickly became anguished over the news. She grew up in Paris. Her daughter lives there now. In fact, her daughter frequents one of the targeted restaurants. While the events disturbed me, this French woman was clearly more pained. She was safe. Her family was safe. But the news invaded her consciousness in a way that seemed to affect her physically. At one point she sat down on the floor, hunched over, and stared gloomily at her smart phone. It wasn’t until I learned that Nohemi Gonzalez, a 23-year-old Mexican-American from Southern California, had been killed in the attack that news of the massacre struck me on a more personal level. Nohemi was an American. Like me. She was a Mexican-American. Like me. She was from Southern California. Like me. Suddenly the horrible events that occurred 5,600 miles away seemed closer to home. What I had seen as tragic now felt sad. A few days after the attacks in Paris, I drove down to Cal State Long Beach, the university Gonzalez had attended, to ask some students how her death had influenced their emotional response to this act of terrorism. At first what I heard were reactions not dissimilar to mine. People ticked off certain aspects of their multi-layered identities that connected directly to Nohemi’s story, which, in turn, made them feel more deeply about the tragedy in Paris. The distinction between generally caring and having that feeling really “hit home” is suggested in the difference between the origins of the words sympathy and empathy. Sympathy derives from the Latin and Greek words meaning “fellow feeling.” The word empathy came to English from the German word Einfühlung, which means something like “inner feeling” or “feeling into.” While often used interchangeably, empathy carries a more intimate meaning than sympathy and suggests that the subject understands and is capable of sharing an emotion with the object. Sympathy, on the other hand, implies a greater distance. In a nutshell, you feel empathy when you can imagine being afflicted by the tragedy in question, and sympathy when you cannot. What 26-year-old senior Catherine Gillespie then told me explains further how identifying—then empathizing—with a victim of a tragedy can help place you, at least on some psychic level, closer to the incident. “The band that was playing at the concert hall where so many people were killed was from Palm Desert, California,” Gillespie told me. “I’m from nearby Indio. If I had been in Paris that night, I would have gone to see them play.” In other words, her identification with the band enabled her to imagine suffering the fate of the concertgoers, which therefore made her feel for the victims more deeply. Her response also suggests that there is a strong connection between empathy and fear. Before last week, I would have told you that selflessness is at the core of caring. But after the events in Paris and listening to people’s reactions, I realize that whatever else empathy does for our psyches, it is also a form of self-preservation. I empathize with you, because what happened to you could happen to me. And that would be really horrible.